Wicked Awesome Adventure: 294 - Knock out CAPTAIN STEELWOOD. Take his WIG. Assume his IDENTITY. Accept the henchmen's SURPRISINGLY FICKLE LOYALTIES. 294 - Knock out CAPTAIN STEELWOOD. Take his WIG. Assume his IDENTITY. Accept the henchmen's SURPRISINGLY FICKLE LOYALTIES. JET: I'd love a job! STEELWOOD and his CREW seem pleased by this development. While your actual motives may be somewhat more vague than your statement would suggest, you have the distinct impression that this was the only course of action which wouldn't result in a hole in your head. Oh my, how... specific. CSC: Excellent. I'll leave you to it, then. I'll send a doctor to tend to my fallen. And should you have need of me, you can find me down the street to the west, near the bridge. Good evening, Miss Thunderson. The CAPTAIN and his men march off to the WEST, leaving you, your own CREW, and the UNCONSCIOUS PIRATE to your own devices. Woof. Chalk up a death for JET. How does that one get summarized in a pithy single line on Tvtropes? I'd say we should enter the Port Authority. They would be best equipped to know where the rest of the candidates are-- we'll impress Steelwood with our efficiency and take the two down before we bother him again. But then... the suggestion could be only my desire to explore speaking. Search the unconscious pirate, relieve him of his weapon and anything else he's carrying before the doctor shows up - he won't know the difference and his boss is too busy to care. 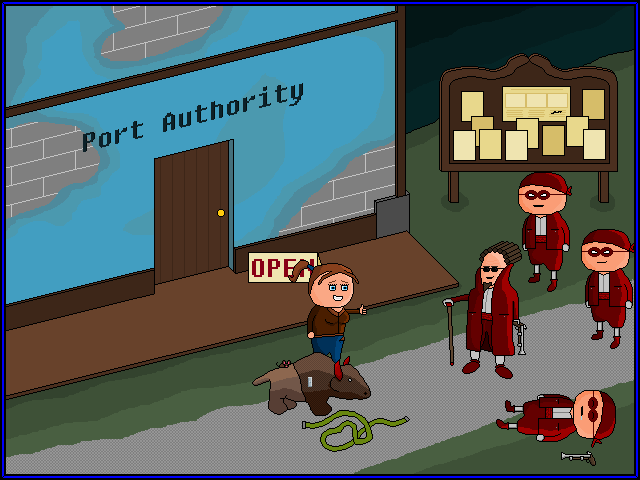 Retrieve the rubber hose and then enter the Port Authority.